With cooler Fall temperatures making their appearance here in Seattle, I didn't think twice when I came across a comfortable looking sweater, priced to sell, at a local used clothing store. I made my purchase happy to have gotten a good deal, but didn't give it much more thought. That is, until I had washed it and slipped it on a couple of nights ago to warm up for the evening after putting Lukas to bed. "Well, at least now we know where Waldo is!" If anyone is looking for me I'll be, ahem, hiding out somewhere here in Seattle. With my comfortable sweater. Does parenting have a Sweet Spot? If so, I think I have entered it. Terrible 2's? What is so terrible about them? Actually, Lukas is at a stage of development that is abundant with wonderful moments. Fun moments. Happy moments. Moments that warm the cockles of my heart. No, I don't know what cockles are, but mine are toasty folks. Could that spot occupy this age, this stage in a child's development? The stage when they can talk to you in a sweet little voice - smiling wide and giving you gems such as "I love you, daddy!" or "Sit down and play with me, daddy" all with genuine heartfelt emotion. Before they ever even think of saying things such as "I hate you!" or "You're mean" or "I hope you die!"? When you mean the world to them almost as much as they mean it to you? When practically everything they do is just so darn adorable, that even those frustrating moments where you have every right to be upset, you just can't bring yourself to be? Well, that my friends. That is the spot I find myself in right now. And it sure is Sweet. A new Pearl Jam tape, album, disc, download, - whatever we are calling it these days, is a big deal in my hometown. After all they are Seattle boys (if you can still call 40 something men boys) who made it big. At EasyStreet Records, my local independent record store, there was even a midnight release party for Backspacer with an overflow location. Not opting to get a sitter, we waited patiently till Sunday to drop by EasyStreet, where my final birthday gift awaited me. Oh, how things have changed. As for the album, I am really enjoying it. I mean REALLY. I have to admit I have been a huge fan since their inception. Mrs. LIAYF even had partial lyrics to Smile ingraved on the inside of my wedding ring ("Don't it make you smile"). Yes, this album was eagerly anticipated, and it didn't disappoint. The songs range from energetic and catchy (Gonna See my Friend) to soulful and beautiful (Just Breath). I usually forgo listening to the radio or music on our drive to daycare, but this morning I couldn't help myself and slipped in the disc and hit the play button. Upon hearing the opening riff of gonna see my friend, Lukas smiled widely and proclaimed "Guitar!". I beamed, and asked him if he liked the music. His head nodded up and down with emphasis, but before the next song ended we had arrived at our destination. On the way home, I turned up the music early on and let him listen. Looking in the rear view mirror I could tell he was liking what he was hearing. All smiles. As the song ended, Lukas let out a big "Yeah!" and clapped. Then he softly opined "It is nice moosic, daddy." Some things, it seems, are inherently genetic. Thankfully, during his first two years of life, Lukas has not developed many fears. Actually, I am not sure I could name more than one or two things that he has shown genuine fear of. So, it surprised us yesterday afternoon when, having let Lukas watch an episode of Elmo's World for the first time in nearly a month, a distinctly frightened cry came from our living room. Mrs. LIAYF and I rounded the corner from the kitchen immediately to see Lukas sitting there in his little chair with an utter look of horror on his face. "Turn it off! Turn it off!" he cried. 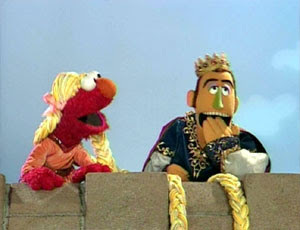 It seems that, in this particular episode of the show, titled Hair, Elmo dons a wig of long braided hair. Not a particularly scary story line to be sure. Well, everything was fine up until the point when the little red guy decided to pull the wig off, holding it out in his furry little hand. It must have seemed like he was pulling his head apart -or something equally disturbing, since it really freaked Lukas out. "It's ok Sweetie. It's only a wig. Kind of like all the funny hats you wear during dress up" Mrs. LIAYF assured him. He didn't seem convinced. Eventually though, he calmed down and we put on a different episode. But it was a pretty bizarre event based on what we have come to expect from our son. As for me, there are only a couple of things I can remember that really scared me as a young child. One was the Maurice Sendak book Where the Wild Things Are. I'm not sure how old I was at the time, but I distinctly remember being deathly afraid of those jagged tooth creatures that roamed in the dark woods, presumably waiting for a tasty child to eat. A coincidence that the movie version comes out close to Halloween? I think not. The other thing, and I know you will understand this one, was the Brady Bunch episode where Bobby has a dream that a UFO lands in their back yard and two little red headed aliens visit him in his room. I can remember staring at my window scared stiff for several nights in a row after that episode wondering when those frightening creatures were going to show up and cart me away. But I am sure that was a common fear for kids my age. No? Really? Did I mention how their hair was red? Tell me readers, what scared the bejeezus out of you as a child? Me: "Hold on buddy, daddy will cut you some more chicken. Where did I put the knife?" Lukas: "I want da kniife"
Lukas: (laughing now) "I-I want kniiiife, Daddy!" Me: "I-I-I want-want DA Kniiiife. . .Pleaaase!" Mrs. LIAYF: (rolling eyes) "You need to stop encouraging him!" Each fall for the past 6 years that we have lived in our current house, September has ushered in a feast of Italian Plums from our lone backyard tree. I have no idea how old it is, but it is mature and has produced ample fruit for Mrs. LIAYF and I to eat whole, cook with, and give away to family and friends. Unfortunately, that has still accounted for only a fraction of the fruit this tree bears and thus each year way too much fruit has gone to waste. Something needed to be done. Then, earlier this year we heard about a local program called Community Harvest. The goal of Community Harvest and their volunteers is to pick fruit trees, such as our Italian Plum, and to make that harvested fruit available to local food bank patrons. We loved the idea and signed our tree up for the program. When the volunteers came to do the picking, I had just arrived home from work and Mrs. LIAYF pulled up with Lukas moments later. "How many volunteers are there?" she asked. "Just two, but they look young and spry" I replied. (they did) "Yeah, you don't sound old at all" she laughed before explaining to Lukas, who had been eating plenty plums off the tree, what was going on. He initially got pretty upset at the prospect of sharing his plums. Tears were shed. However, Mrs. LIAYF explained to him that we would be sharing these with families who need them, and asked him if he wanted to help with the harvest. He was excited to help out, even requesting I lift him up high to get the hidden fruit. When finished, over 200 lbs of fruit was harvested for our local food bank. Eight boxes full, not counting the half box we kept for ourselves. It proved a bountiful harvest, and a great opportunity to teach our son a valuable lesson in sharing. Especially when you have more than you can consume. Today I realized the answer to life, the universe, and everything. Well, at least according to The Hitchhikers Guide to the Galaxy. Yes, today I turn another year older - 42 actually. Blow out the candles. Get enthusiastically sung to. Open fun gifts from my wife and son. And, in case you aren't quite comprehending what I am getting at: Today is my birthday! Why am I making such a blatant pronouncement about this? Well, last year my birthday fell on a Friday, and attempting to be a bit clever with my own birthday post, I posted this Haiku Friday entry which was greeted by a resounding cyber silence. That birthday post from last year continues to be the only post since the early days of this blog that garnered absolutely NO comments. Kinda laughable if you think about it now, but in the days following that post I was a bit melancholy that none of my blogging friends had figured it out and left me a comment. Mrs. LIAYF just shook her head at me and told me that I needed to more obvious. She was right, as she often is. So, again, today is my BIRTHDAY! Do as you will. P.S. The meaning of everything isn't actually 42, as Deep Thought calculates in The Hitchhikers Guide. Ever since Lukas was a couple of months old, we have owned a very nice BOB stroller. If you aren't familiar with the BOB, it is a jogging stroller with sturdy construction, excellent suspension, a swivel front wheel, and two large back wheels for easy off road/sidewalk navigation. Plus, it folds down to a compact size that fits easily into even the smallest trunk. Sounds pretty cool, huh? 1. Let him walk - Yes, this was difficult at times. Especially when he was about 12-18 months since he wanted to grab everything in sight. But we opted to redirect him rather than subject him to sitting strapped into a place that limited his movement and visibility. 2. Carry him - We often will just carry Lukas around when we go somewhere, switching him from hip, to shoulders, to the other hip, to the other parent. He really loves to be on our shoulders where he can see all that is going on. 3. Red Wagon - We live close to a neighborhood business district where we can walk and shop locally. Lukas much prefers to ride in his wagon than the stroller. Plus, he gets to say "Hi!" to all sorts of people, who generally brighten considerably afterwards. Combine all these things, and we have used our stroller maybe one or twice in the past 9 months. In truth, I am questioning whether we will ever use it again with our little guy. He is past 2 years old now and gets around extremely well on his own. I have been wondering if this is a normal transition or if we are just not stroller people. I do see other parents pushing around much older kids, but can't really envision that being us. I suppose if I suddenly took up jogging, I might use it more often (Yes, that was intended as a joke. You can stop smirking now Mrs. LIAYF). Or possibly we don't use it much because we only have one child. Maybe we will use it much more once there is another family member in the picture. Assuming that happens in the foreseeable future. How about you readers? I'm curious. At what age did you give up using a stroller for your kids? We visited Grandpa and Grandma's farm yesterday. Being a city boy, this is a trip which always gets Lukas excited. And, as always, he had a terrific time. Of course, as soon as we arrived he was all about taking a ride on the "BIG" tractor with Grandpa. Grandpa was happy to oblige. Lukas was able to sit and steer by himself as they drove around the farm for quite a while. Afterwards, he ran through the barns and generously fed the animals. And, of course, played in the mud puddles with sticks. A perfect day for a two year old boy. Then later, after a birthday lunch - as is usually the case - I realized I was missing a prime video moment while Lukas was singing for the family. By the time I got the camera set up, he was winding down, but I did get a bit of him butchering his ABC song. It's cute though, and you even get a shimmy from Mrs. LIAYF. Perhaps I am a great role model for my son in more ways than I am aware of. I eat it up like leftover pizza when Lukas flashes a big smile and announces that he wants to do one thing or another "Just like daddy!". I mean, come on, what is a better elixir for a father after a stressful day on the job than hearing such a phrase? However, over the past few days that is not the only thing Mrs. LIAYF and I have been hearing coming out of Luke's mouth. No, he's not dropping any F-bombs. After leading an early life with speech littered with profanity, the likes of which might make a truck driver blush, I have cleaned up my act to the point that it is an extremely rare occasion where I let a proper profanity fly. No, what is coming out is something altogether different. How best to describe it? Um, I am not sure. It's an annoying little speech placeholder which a verbose 26 month old certainly does not need to use. Let's see, um, it's not really a word but more of a sound. Some adults have been know to slip it into conversation on occasion and actually not even realize it. My wife, um, seems to think that he must have picked it up from me, but I can't really see where she got such a notion. Although cute, it is a bit annoying to listen to your two year old use this dozens of times over the course of an evening for the pure novelty of it, and perhaps to be 'Just like daddy!' "What are we going to do about this development?" My wife said to me as she gave me one of those 'this is totally your doing' looks. "Well...um, I think we should just ignore it. I'm sure he will stop using it soon enough."